We recently partnered with our friends from BreadBox to provide you some incredible toast recipes that you can make in the comfort of your home. 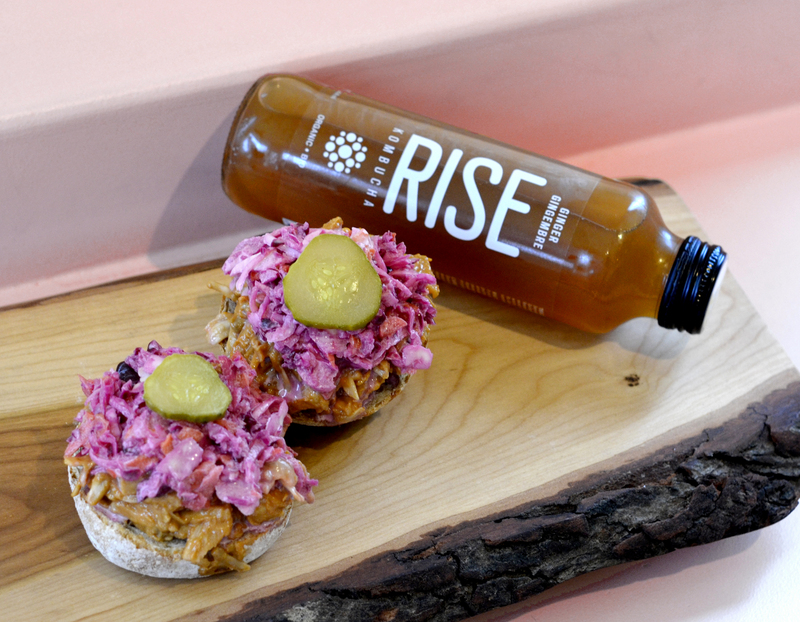 Last time, we showed you how to step up your breakfast game with a Vegan Lox toast, accompanied by a sweet RISE Hibiscus & Rosehips. Now, we’re going for the big leagues: pulled pork. Vegan pulled pork, more precisely. Made on a BreadBox Mini Sourdough Roll. Want to know how to make your colleagues jealous when it’s lunchtime? Here’s the breakdown for ya. 1. Preheat your oven to 400F (200C). Lightly grease a baking pan. 2. Drain the jackfruit and cut the it into smaller pieces by cutting it from core to the edge for the most pulled texture. 3. Add the olive oil to a large frying pan or skillet over medium-high heat, and when hot add the onions and garlic. Sauté until the onions are beginning to brown. Add in the chopped jackfruit, then vegetable broth. Cover and continue to cook another 8 to 10 minutes, until the jackfruit has absorbed the broth and it is soft enough that it can be mashed. 4. Mash the jackfruit with a potato masher, until it breaks apart and looks similar to the texture of pulled pork. 5. Add in ½ cup BBQ sauce and mix it up. 6. Remove the jackfruit from the pot and place it on a baking pan, spread in an even layer across the baking pan and then pop it in the oven for 15 minutes. Remove it from the oven and pour on another ¼ cup of BBQ sauce, mix it up and toss it back in the oven for about 10 minutes, until it looks delicious and golden and even a few strands get a bit burnt. Remove from the oven and feel free to stir in any extra BBQ sauce if you like it even saucier. 1. Place the shredded cabbage and carrot into a salad bowl. 2. In a small bowl, whisk together the maple syrup, apple cider vinegar, mayonnaise, salt and pepper. I like to start with a small amount of syrup (1/2 tablespoon) and gradually sweeten to taste. You can always add more, but you can’t take any out. 3. Pour the coleslaw dressing over the slaw and toss to combine. Place Vegan Pulled Pork on half a BreadBox Mini Sourdough roll, place coleslaw on top and garnish with sliced pickles and hot sauce if desired. And to make sure you get a full stack of flavours, complete your lunch with a RISE Ginger. The best way to add a little tangy twist to the meal, ya know. Sit back, relax, enjoy. And let your belly be happy. Interested in getting fresh bakery style Sourdough bread in just 20 minutes? Find out below where to buy a BreadBox.